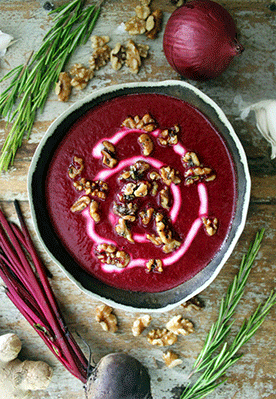 This rich and creamy soup is sweet with roasted beets and velvety coconut milk, with a colour that’s just right for Valentine’s Day. To add texture, it’s finished with crunchy walnut and chia croutons, seasoned with a little rosemary and sea salt. 1. Preheat the oven to 200°C/180° fan assisted. Peel the beetroot and slice in half. Arrange on a shallow oven tray and drizzle with a tablespoon of olive oil. Place in the oven to roast for 35–45 minutes until tender and caramelised. 2. Whilst the beetroot cooks you can prepare the walnut croutons. Add all the crouton ingredients to a small mixing bowl and stir together well to combine, ensuring the walnuts get evenly coated in the seasonings and seeds. 3. Line a shallow oven tray with baking paper. Tip the nuts out onto the oven tray and spread the mixture evenly. 4. Once the beetroot is cooked, remove from the oven and set aside. Reduce the oven to 160°C/140° fan assisted. 5. Transfer the walnuts to the oven to bake for 15 minutes, turning halfway through. Set aside to cool completely. 6. Heat a tablespoon of olive oil in a large pan over a low/medium heat and sweat the garlic and onion until tender. Add the chopped rosemary and fresh ginger to the pan and stir to combine. 7. Dice the cooked beetroot and add to the pan, season with salt and pepper and stir well. Add the hot vegetable stock to the pan and bring the soup to a boil, then reduce to a simmer for 10 minutes. 8. Add the coconut milk to the pan and stir through the soup. Transfer the soup to a blender and blend until silky smooth. Scatter with walnut croutons to serve and an extra drizzle of coconut milk if desired.